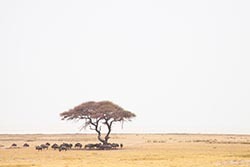 The Ongava Tented Camp is located in the much lauded Ongava Game Reserve to the South of Etosha National Park. It overlooks a nearby waterhole to which a plethora of wildlife congregates to drink. 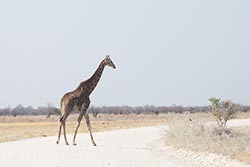 To reach Ongava Camp from Mushara Outpost we had the opportunity to drive right across Etosha National Park. It was a game viewing drive all along. The highlight of course was spending time at Etosha Outlook – a location that will make one feel as being on a different planet altogether. For miles and miles the eyes see nothing but the snowy white pans, punctuated with pastel coloured patches. Another highlight was being just next to a resting rhino. 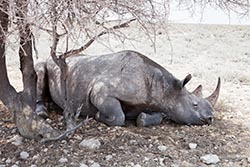 This rhino was sleeping right on the edge of the gravel road under a tree, least bothered about our vehicles. It appeared quite like Namibians waiting for their bus at a designated spot! We were close enough to hear the rhino’s breathing! The drive was quite eventful despite not having a flat tyre! Giraffes, elephants, ostrich, oryx, wildebeest, springboks were our pals along the way. Just after noon, we were at our camp, welcomed well by the camp’s friendly staff. Before we were allowed to go to our dwellings came an important announcement – no one was allowed to step outside their tents, especially after sunset, unless accompanied by an armed guard! That told us all… the camp has lions and rhinos and other friends from the wild also as occasional visitors. After a little rest we were ready for our afternoon safari. 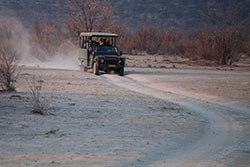 The camp offers guided safaris in their open Jeeps with knowledgeable drivers who double up as guides. The mission was to spot rhinos and lions. For two hours we saw nothing except the usual. And then, miracle happened. Right in the middle of the paved road, we met a pride… 2 males, 7 females and 7 cubs! The 16 of them were walking towards the waterhole, so said the experienced driver after observing that the lions were full with a hearty meal. For almost an hour we followed the group. Sure enough they reached the waterhole and that would be their spot for the next few hours. We were also lucky to see the mating of one of the lions with one of the lionesses. And we also saw a fight between the two lions… the winner took the lioness in heat. 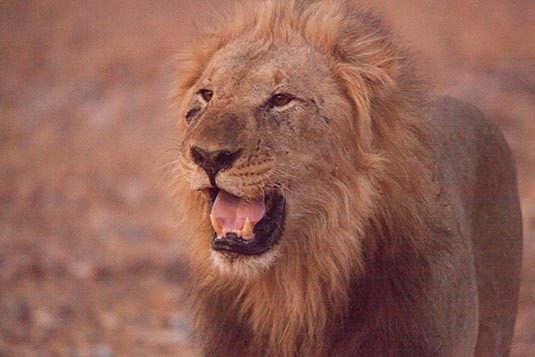 Entire jungle reverberated with the majestic roar of the king! And as if this wasn’t enough, we spotted in the distance a mother rhino with her cub. They wanted to come to the waterhole, but did not since the mother knew the lions were there. Our guide was sure that eventually the rhino would come for a drink. It was dark already. We returned back to the camp. After dinner, on our special request, we went back to the waterhole. And there we saw 6 rhinos enjoying their drink. Yes, the mother and the cub were there too. Our lucky day. And night too. The next morning, post breakfast, we would drive towards Damaraland.